1814. I t is believed that a group of non-conformists began meeting in Great Baddow in 1814. A Congregational Church had been in existence in Baddow Road, Chelmsford (where the High Bridge roundabout is now) since the early 18th Century and later the London Road Congregational Church was built, by the river (where Alders furniture shop used to be). A small building was erected in Great Baddow in 1848, to seat about 60, under a trust deed with the London Road Congregational Church. In the main they provided the preachers for this chapel at Great Baddow but otherwise the local leaders (Deacons) managed the affairs of the chapel. Later a small lean-to extension, to form a vestry/kitchen was added to the back and a small separate W.C. and a store shed. Many years later some additional land was purchased, for a "new" church. 1939/45. 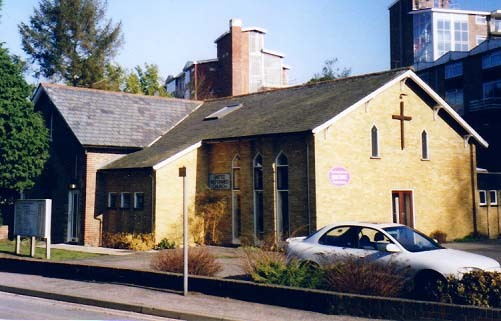 Just after the 1939/45 war the chapel became a church (Congregational with a diaconate serving in its own right) but in conjunction with the Baddow Road Congregational Church. 1951. The first minister (part-time) came in the 1950's, Rev. Robert Roope, who had retired from Upminster. The first extension was built in 1951, the red-brick and flat roofed hall. The buildings suffered severely from the 1958 floods (30" deep) but an appeal enabled valuable help to be received in recovering from this damage. 1956-71. The Rev. Roope left in 1956 and lay preachers and student pastors helped with services until the Rev. Guy Bignall was Ordained and Inducted in 1960, having retired from industry in his 50's to become a Minister. At the end of 1961 an army hut was purchased and erected on the adjoining land and a car park provided. This building 20 x 60 feet served for many years for social activities, Sunday school and youth work and sometimes for special services, being larger than the church. Also a kitchen unit was installed in the red-brick hall, to cope with the extra catering needs of the larger attendance and increased use. The Rev. Bignall moved on in 1965 and the Rev. Gilbert Nunn came in 1966 and further improvements were started in 1968. This was a new building to join the existing brick hall to provide a committee room, Minister's vestry and ladies and gents toilets. This was still separate from, but with easy access to the rear of the church, but with plans to link up as soon as possible. The Rev. Nunn moved to Lancashire in 1970 but our next alteration continued as planned in 1971 with demolition of the old 'lean-to' vestry and toilet, linking up the newer block to the rear of the church and adding a side entrance and lobby to the front part. Pews were also installed from the Baddow Road Church which had then been demolished. Re-dedication of the altered Church took place on the 10th June 1971. Farmer 1972-73. The 5th October 1972 saw the birth of the United Reformed Church (URC) with the union of the Congregational Church and the Presbyterian Church in England. This involved a few changes and included the ordination of Elders. Towards the end of the 1960's it became necessary for the smaller churches to share ministers and in fact the Rev. Nunn was inducted also to Writtle in 1968 and our next minister, the Rev. Ken Prior, who came in 1973, was also responsible for the two churches as well as being part of the team ministry of United Reformed Churches in Chelmsford. 1976-77. Our next alteration was in 1977 with the original hall being extended, the committee room being divided to make a new vestry and the vestry being turned into a well fitted kitchen. We now had room and the facilities for more meetings and activities. There was a well attended Junior Church, toddlers and various children's and young peoples groups, Women's Fellowship and other Church associations meeting regularly. A weekly coffee morning, on Tuesdays, had been started in 1971 and also benefited from the improved kitchen etc. A Community care group was formed in Great Baddow in 1976 and we were able to start the Luncheon Club in April 1977, to provide a lunch every Tuesday for elderly folks who would benefit from good food and fellowship. It started with sixteen people and is still going strong with about 30 meeting every week for a modestly priced lunch. 1979-85. The Rev. Ken prior moved to Kent in 1979 and there were some changes in the grouping of the URC's and when the Rev. John Farmer came in September 1980 he was Inducted to the Chelmsford Group Ministry, with responsibility for Great Baddow, Danbury and Howe Green. This was for a good period, Sunday congregations had been growing and all activities well supported. Our church was too small and the hall (old army hut) coming to the end of its useful life, so our most ambitious alteration planned which started in July 1985. This hut was removed, the side wall of the church knocked down and the construction of the 'New' church begun. We moved into the rear hall for our Sunday Services and thanks to our friends at St. Mary's we were able to use the Bell Street hall for our Junior Church on alternate Sundays. The land adjoining ours (through to Pump Hill) was council owned and the new library planned so our car park was made in collaboration to give them staff parking and access for library vehicles. The New Church was Dedicated in April 1986 and has room to seat 150, or more when necessary, and we were blessed with very good congregations for a few years, and thriving children's and associated groups. 1987-2001. The Rev. John Farmer left in July 1987 and the Rev. Roger Cornish came in September. In April 1989 he, and the Rev. Stephen Foster (St Andrew's Church, Sandon) took a group from our churches together with some friends from St. Mary's and Danbury on a tour of the Holy Land, something we will always remember. The Rev. Cornish left at the end of 1989 and we were without a minister until September 1992 when the Rev. John Gardiner came to join the Chelmsford Group of the URC. Some of these churches had Lay Leaders and the Rev. Gardiner gained responsibility for overseeing the other group churches. 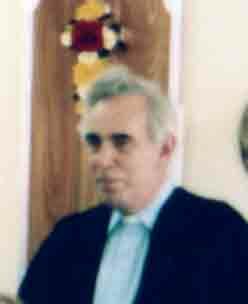 Mr David Pennicott became our Local leader and Pastor in December 1998. The Rev. Gardiner retired in April 2003. Our latest building project, a much enlarged and refurbished kitchen, and the provision of a toilet for the disabled, and a new toilet for ladies, was completed in 2001. We have been so grateful to the leadership and guidance of all the ministers and pastors and the visions to bring is this far. Many people have given freely to finance the projects and worked hard to achieve them. Up to the 1960's the little church was at the edge of a small field with the manor house and large garden behind known as The Vineyards, being run then as a guest house / hotel. The shopping centre, which now bears its name, was built on that site a few years later. History written by Eric Manning - Elder of Great Baddow United Reformed Church.